For Aboriginal communities in Canada, the need for science education to be both transformed and transforming is more urgent today than ever before. The legacy of a colonialist educational system and the under-representation of Indigenous Science in the curriculum is a key factor in limiting Aboriginal people’s futures. The need for Aboriginal peoples in science, technology, and health-related careers is urgent (Canadian Council on Learning (CCL), 2007a, 2007b). This is particularly true of the schooling and educational circumstances of most Indigenous peoples who live in colonized nations around the Pacific circle, the US, Canada, Australia, New Zealand, South America, and elsewhere in India and African countries. In trying to understand what has gone wrong, various researchers have focused on problems associated with the Aboriginal learners themselves; others have focused on socio-economic problems; some on language and cultural differences; some on definitions of science and the so-called “science wars,” still others have focused on school structures and governance. The transformation of science education for Aboriginal learners is not merely a set of strategies related to changing learners’ behaviour, changing the curriculum or pedagogy, changing definitions of science, or changing governance. Transformation will also need to occur in the wider context of both the Aboriginal and non-Aboriginal communities. From an educational point of view, our work as teachers and instructors must also be called into account. We need to question what we do educationally through academic teaching and research, through teaching Aboriginal children in the science classroom, and through interacting with parents, Elders, and communities. What is the current state of science education for Aboriginal students? How did we arrive at the current state? What factors inhibit the progress of Aboriginal students in science? What counts as science? Do Indigenous peoples have science? Should Indigenous Knowledge be included in the science curriculum? What is the role of education in the transformation of society? What counts as transformation? How will we know when transformation has been achieved? What is the mandate for transformation of the science curriculum? What interests are at stake, and whose interests are being served? What should the future of science education in Canada look like? The above questions set the context for bringing together a range of issues touched upon in this chapter. 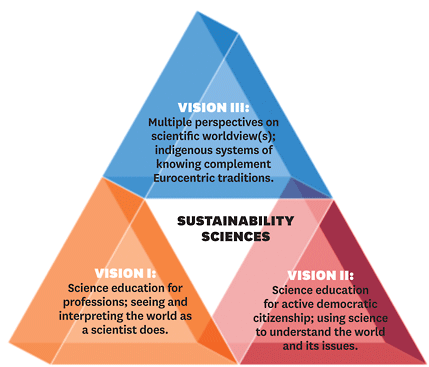 The chapter concludes with a new vision for science education in Canada, with sustainability and Indigenous worldviews at its core. Canada has been celebrated for its contributions to human rights, the rule of law, a multi-cultural country of equality of opportunity, and a high socio-economic quality of life. It is clear that Canada is a multi-ethnic and multi-cultural society. Half a century ago, most immigrants came from Europe, now most newcomers come from Asia. While most newcomers have fared well and prospered, there is little evidence that Aboriginal peoples have participated in the economic, political, and educational spheres. Canada is ranked in the top 10 countries on the UN Human Development Index, but Canadian Aboriginal communities ranked 79th, reflecting structural inequalities in access to education, housing and clean water (Bennett, Blackstock & De La Ronde, 2005, p. 7). Education for First Nations, Inuit and Métis is chronically underfunded. Aboriginal children receive 60 to 80 per cent of the funding that non-Aboriginal children receive. According to the 2006 Canadian Census, 60 per cent of First Nations and 75 per cent of Inuit students do not complete high school, compared with 15% of non-Aboriginals. While off-reserve status First Nations and Métis fare better, there is a growing education gap. The Aboriginal population with a university degree has increased slightly since 2001 (from 6 to 8%); however, they still lag far behind the non-Aboriginal population (23%) (2006 Census Aboriginal Demographics) and the gap continued to widen between 2001 and 2006. Since 2001, the Canadian Aboriginal population increased by 25%, compared with 6% for other Canadians. The unemployment rate for Aboriginal people aged 25-64 remained almost three times the rate for non-Aboriginals, and exceeded the national rate in every region. It is projected that between 2001 and 2026, more than 600,000 Aboriginal youth will come of age to enter the labour market. The 15-29 age group, in particular, is projected to grow by 37% compared with 6% for the general Canadian population (Hull, 2008). Yet, in recent years alarms have been raised about a possible crisis in the Canadian labour force—a shortage of labour caused by low birth rates and the aging Canadian population. Studies predict that this declining growth of the labour force will have a negative impact on the economy. Clearly, Aboriginal youth represent a potential wealth of future labour resources. Hull (2008) suggests that “the rapid growth rate of the Aboriginal labour force presents an opportunity to offset these demographic pressures to some extent and could benefit both Aboriginal people and the Canadian economy” (p. 40). There is abundant evidence that Aboriginal students are under-represented in high school science classes Canada wide. According to Aikenhead and Michie (2011), “the under-representation of Indigenous students in high school science courses is a major challenge for science education in industrial countries” (p. 8). As well, Indigenous people in Canada are under-represented in science and engineering occupations (Battiste, 2002; CCL, 2007b; Canadian Education Association, 2016). The proportion of BC public school students self-identifying as Aboriginal is about 11% of the total student population (BC MoE, n.d.). The total BC public population (K-12) in the 2010/11 school year was 515, 206 with 63, 899 identifying as Aboriginal—9, 908 students were classified as on-reserve and 53, 991 as off-reserve. A source of information for secondary school achievement in science courses are the required formal provincial examinations (BC MoE, 2011a) and optimal (BC MoE, 2011b) for Grades 10 and 12 courses in the BC graduation program. MoE provides examination scores and blended marks composed of examination and course marks. Yore, et al., (2014) defined Indigenous as First Nations, Inuit and Meti. The research group used both sets of data to explore Indigenous and non-Indigenous students’ achievements. Comparisons of 2010-2011 enrollment and required examination data demonstrated that Indigenous students were substantially under-represented, with low participation rates in science and mathematics courses. Specifically, Aboriginal students were substantially under-represented with low participation rates in university preparation courses (English 10, Mathematics 10, Science 10, Social Studies 11, English 12), and were over-represented in alternative and specialized First Nations courses (Math 10, Apprentice & Workplace, First Nations Studies, and Community 12). The success C-pass or better rates across the various examinations revealed a consistent pattern, where the percentage of Aboriginal students achieving a pass or better rating is lower than the percentage of non-Aboriginal students achieving the same rating. Aboriginal students fared well in the alternative courses indicting a higher level of achievement in these culturally-responsive courses. An indicator of preparation that better predicts success requires a higher level of achievement on the required courses. When the cut-off was raised to indicate percentage of students earning a good rating (C+ or better) on these examinations, the gaps increased slightly for the alternative courses, but nearly doubled for the standard courses (Table 2.1). These data were considered likely better indicators of the performance gap between Indigenous and non-Indigenous students and predictors for acceptance into post-secondary sciences. The newly revised science curriculum for British Columbia (2015), as described by the BC Ministry of Education web site, makes references to Aboriginal knowledge and worldviews, promotes a place-based approach to learning, and encourages teachers to incorporate Traditional Ecological Knowledge (TEK) examples into their science curriculum. However, the representation of Indigenous Science tends to be piecemeal and often as isolated examples and not as a coherent whole. While it is significant that teachers are given the mandate to incorporate TEK in the science curriculum, teachers are provided very little help to include examples of Indigenous Science into their curriculum. As well, teachers are not provided information about Aboriginal worldviews and teaching strategies that facilitate responsible cross-cultural science education. Thus, many Canadian provincial and territorial documents have not explicitly considered culture, dominance and power as variables in students’ understandings (McKinley, 2007), and have overlooked the effects of colonialism in science education (Belezewski, 2009). Table 2.1 Percentage of Indigenous and Non-Indigenous Students Earning Good (C+ or better). Yore, L.D. et. al. (2014). Closing the science, mathematics, and reading gaps from a Canadian perspective: Implications for STEM mainstream and pipeline literacy. In J.V. Clark (Ed. ), Closing the Achievement Gap from an International Perspective: Transforming STEM for Effective Education (pp. 73-104). New York: Springer. Data Source: Provincial required examinations—2010/11; Provincial public and independent schools combined. Victoria, BC, Canada: British Columbia Ministry of Education. * Denotes alternative course to normal required course. If a more rigorous cut-off criterion of the students’ earning good grades (C+ or better) in these elective courses is used, the gap favoring non-Indigenous students increases to approximately 10-22% (Table 2.2). The authors consider these data were likely better predictors of the performance gap between Indigenous and non-Indigenous students, and therefore, better predictors for acceptance into post-secondary studies in the field of science. For both Indigenous and non-Indigenous students, the least popular elective courses were modern foreign languages, mathematics applications, geology, geography, chemistry, and physics. The most popular elective courses were biology, principles of mathematics, and history. Mathematics, often referred to as the “gatekeeper of science,” is linked with success in the sciences as numeracy skills can impact success in science courses, particularly physics and chemistry. The WNCP research project reported that many Indigenous students struggle with mathematics (McAskill et al., 2004). An examination of the 6-year completion data for 2006-2011 showed a continuing increase in graduation rates for Indigenous students from 48% to 54% (2010/11) while participation rates in all the subjects remained relatively stable. Although the upward trend is positive, it is still concerning that this rate continues to significantly lag behind the 83% completion rate of non-Indigenous students. Mendelson, 2006) stated, “Failure to complete high school explains 87.7% of the variation in post-secondary education completion rates among provinces and territories. This is an extremely strong correlation and is further evidence that success in post secondary programs starts with success in the K-12 programs” (p. 31). Table 2.2 Percentage of Indigenous and Non-Indigenous Students Earning Good (C+ or better). Yore, L.D. et. al. (2014). Closing the science, mathematics, and reading gaps from a Canadian perspective: Implications for STEM mainstream and pipeline literacy. In J.V. Clark (Ed. ), Closing the Achievement Gap from an International Perspective: Transforming STEM for Effective Education (pp. 73-104). New York: Springer. Data Source: Provincial required examinations—2010/11; Provincial public and independent schools combined. Victoria, BC, Canada: British Columbia Ministry of Education. Clearly, these participation and success rates for Indigenous students in the sciences supports the need to develop more relevant, supportive, and culturally responsive science and mathematics curricula and programs at all levels: elementary, secondary and post secondary. For example, the most commonly reported indicator that measures success of Aboriginal learning is the high school completion rate, and the most commonly reported indicator of success in school science is the completion rates in senior high school sciences. Furthermore, current research tends to not recognize that the economic, health and social challenges that inhibit Aboriginal people’s opportunities for life-long learning continue to exceed those experienced by non-Aboriginal Canadians (CCL, 2007a). “Poor economic and living conditions also contribute to comparatively poor health” (p. 9). Thus, persistence and intention to complete post-secondary education is not necessarily about lack of ability, it is about the many challenges found by these students in their lives, their family’s lives, and the life of the community (Kanu, 2006). In addition, many Inuit and First Nations students living on reserves have historically reported that their primary reason for dropping out of high school was the requirement to leave their community and travel long distances to attend the nearest high school or university. This meant that they had to leave behind parents and community support. Thus, the Annual Report on the State of Inuit Culture and Society (2010-2011), recommends an education in which Indigenous children attend school in their home communities or regions, have significant opportunities to learn in their own languages, and that parents and community have the right to control their educational institutions in a manner appropriate to their cultural methods of teaching and learning. An early federal government policy for First Nations was to use education as a tool to disconnect children from the older generation. The federal government took advantage of schools built by missionaries, funded them and built more schools across the country to send children as young as 5 or 6 of age to spend 10 months a year away from their families and communities. The children in the first several generations were fluent speakers of their mother tongue. In the residential schools, they had no opportunity to speak their mother tongue and had little opportunity to speak one of the colonizing languages. Children were punished physically and psychologically if they spoke in their mother tongue. Over the years, away from their families and communities, the children’s usage of English or French increased and their mother tongue usage dwindled in use. Thus, upon their return home communication with their families was negatively affected. Children were away from the active lives of their families on the land during the time they were in school. While on the land children worked alongside the family and community members and during these times they learned by observing and copying the experts who modeled how to live on the land. They heard the pertinent stories and songs that went with each activity. As a result of the residential school they did not benefit from the teachings of their families and communities. The human ability to adapt to new situations is dependent on the cultural teachings of the older generations. The trend to break the hold of the older generation and to disrupt the natural communication patterns through schooling continued in the federal day schools built on some reserves and continued even after the children were admitted to public schools in the 1960’s. To protect them, many parents began to withhold cultural knowledge, stopped taking them out on the land, and stopped speaking their mother tongue to their children. Parents thought this would help the children be successful in the schools. English is not spoken in some Aboriginal homes, or, if it is spoken, it is as a second language. Communication problems are both verbal and nonverbal (Aikenhead & Michell, 2011; CCL 2007a; Michell, Vizina, Augustus & Sawyer, 2008; Snively & Williams, 2008). There is continued insensitivity to Indigenous cultures and communities that often results in absence from school, parent apathy, and community alienation (CCL 2007a; Edwards, 2004; Michell, Vizina, Augustus & Sawyer, 2008). School frameworks, personnel and curricula are frequently characterized by attributes such as rigid time-tables, self-expression, aggressiveness, hierarchical, and working for personal advantage; which run counter to the values many Indigenous cultures place on cooperation, group and community well-being, and, when appropriate, silence (CCL, 2007a). Rigid timetables combined with lack of funding that allows for field trips and extended outings to explore and learn about cultural territories, landmarks, place-names, teachings on the land with Elders and language nests (Edwards, 2004; Snively, 1995). Lack of appropriate procedures for assessing understanding and competence of cultural knowledge (CCL, 2007a). Teachers and resource persons from Aboriginal or Métis backgrounds, who can serve as positive role models, are not widely available (Aikenhead & Michell, 2011; Michell, Vizina, Augustus & Sawyer, 2008). The racist attitudes of many non-Aboriginal staff and students (CCL, 2007a; Edwards, 2004; Kanu, 2005). Distance from university, leaving the home culture to attend university, and communication from a distance (Mullens, 2001). Poverty, poor economic and living conditions, and poor health (CCL, 2007a, 2007b). The modern view of science is often completely foreign and at odds with Native spirituality or a holistic understanding of the world (Battiste, 2000; Cajete, 1999, 2002; Snively & Corsiglia, 2001). The image of the scientist as the controller, manipulator, and exploiter of the environment conflicts with the cultural values of many children (Cajete, 1999, 2000; Snively, 1995; Snively & Corsiglia, 2001). The reluctance or refusal of western science teachers and administrators to bring Native spirituality into the science classroom, and in so doing, reject all Native science as outside the world of science education (Cajete, 1999; Michell, Vizina, Augustus & Sawyer, 2008; Mullens, 2001). Lack of knowledge and research into Aboriginal students’ prior knowledge (ideas, beliefs and understandings of science related concepts and processes), and how to take their ideas into account in the science classroom (Aikenhead & Jegede, 1999; Fleer, 1999; Kawagley, 1995; Snively, 1995). Mainstream teachers have a limited professional science knowledge for teaching science, and an even less adequate knowledge base for helping students move back-and-forth between their Indigenous culture and Western Science (Aikenhead & Michelle, 2011; Belczewski, 2009; Berger & Epp 2005; Lewthwaite & McMillan 2007; Lewthwaite, McMillan, Renand, Hainnu, & MacDonald, 2010). Lack of culturally appropriate science textbooks and resource materials (Aikenhead & Michelle, 2010; Battiste, 2000; Kanu, 2005, 2006; Lewthwaite, McMillan, Renand, Hainnu, & MacDonald, 2010; Michie, 2002). Lack of appropriate assessment procedures that take into account the cultural science related knowledge of Aboriginal communities, and that holds non-Aboriginal students responsible for knowledge of Indigenous Science (CCL, 2007a). Lack of clear and consistent guidelines from Ministries of Education and Territorial jurisdictions. Conflicting guidelines between elementary and secondary recommended and prescribed learning outcomes for science (Lewthwaite, McMillan, Renand, Hainnu, & MacDonald, 2010; Littlebear, 2009). Lack of unified leadership at the university level across Canada in the training of pre-service teachers with regard to culture and science methods courses (Snively, 1995). Lack of adequate funding; e.g., for developing culturally responsive science curriculum materials, funding for fieldtrips, providing focused and sufficient professional development for teachers, funding for Elders and knowledge keepers to visit classes and teach on-site in the local territory (Snively, 1995). Lack of research from an Aboriginal perspective, lack of appropriate methodologies for investigating the cultural knowledge of Aboriginal children (Battiste & Henderson, 2000; McGregor, 2004). The marginalization of Aboriginal students in school science has long been a concern for Aboriginal leaders, science teachers, professors, ministries and departments of education, the Canadian government, the Science Council of Canada (1991), and science education organizations such as the Canadian Aboriginal Science and Technology Society (CASTS). Although thoughtful innovations in some jurisdictions have successfully encouraged teachers to incorporate examples of Indigenous Science in the science curriculum, and some science-minded Aboriginal students have been attracted into science courses and careers, these initiatives fall seriously short of resolving the general problem of under-representation. The findings indicate that an Indigenous cultural view of science education is not presently widespread in Canadian schools, particularly at the secondary level, and for many jurisdictions they describe a system of education in which students are expected to accept a western modern view of science as superior, and to accept presented information without question. Such techniques not only go against what is presently known about effective teaching, but also discourage students from seeking to understand the science that is taught in schools. Cobern and Loving (2001) have defined what they call the “standard account” of science and exclude Indigenous Science from the science classroom primarily because they claim it does not have an experimental base, is not theory driven, and can’t be used to predict future events. On the other hand, authors such as Cajete (1999, 2000; Snively & Corsiglia, 2001; Snively & Williams, 2008) have called for the inclusion of Indigenous Science, primarily because of its numerous scientific and technological innovations and its wisdom practices that focus on balancing human needs with environmental requirements. Generally, Indigenous societies stress order and harmony, but they also acknowledge diversity, chance and the unexpected. It is a disciplined process of coming to understanding and knowing. The fact is numerous traditional people’s scientific and technological contributions have been incorporated in modern applied sciences such as biology, environmental science, geology, medicine, astronomy, architecture, pharmacology, agronomy, agriculture, animal husbandry, fish and wildlife management, nautical design and navigation, engineering, and plant breeding. Suggestions that Indigenous peoples cannot practice “science” reflect narrow and restrictive definitions, old justifications, and insufficient factual data. (See chapters 6 and 7 for more in-depth descriptions of Indigenous Science, with its innovations in science and technology and time-tested sustainability practices). Many scholars of Indigenous Science, (Aikenhead & Ogawa, 1999; Aikenhead & Michell, 2011; Cajete, 1999; Michie, 2002; Snively & Corsiglia, 2001) argue that the Western way of thinking that has divided knowledge into various disciplines is a relatively recent phenomenon, and must reconstruct itself from its various disciplines in order to match the more holistic Indigenous approach to knowledge. As such, science education needs to celebrate the positives about Indigenous cultures, and this includes science as part of culture. There are those who would argue that there is no such thing as Indigenous Science, that “science” is an invention of the modern Western society, and that Indigenous people have a body of cultural folklore and thought which cannot be considered a rational and ordered system of theory and investigation comparable to Western Science. Whether there exists an Indigenous Science in western accounts is largely an argument of semantic definition. Use of western definitions and orientations to measure the validity of non-western ways of knowing and being in the world has been applied successfully historically to deny the reality and validity of Indigenous Science. The fact is, Indigenous Science exists, has made invaluable contributions to the body of knowledge we call science, and has been validated by numerous western scientists, as well as courts and international governments. Any attempts to define “science” falls short, as definitions of science are fluid and always change as cultures change. So Why Does the Low Participation of Aboriginal Students in Science Matter? a way of enabling Aboriginal students to be successful in school science. Although this chapter focuses on the need for transforming the science curriculum for Aboriginal students, there is also a focus on “science for all” as a guiding principle for achieving scientific literacy through science education. “This breaks away from the science/science education nexus which has seen the products of science education as proto-scientists rather than as people living in a scientifically literate, multicultural society” (Michie, 2002, p. 36). So, why does it matter that Aboriginal students are not taking science? For a start, there is currently a critical shortage of Indigenous people in science and engineering related fields (CCL, 2007a, 2007b). In fact, the number of Indigenous people in both educational and occupational fields featuring science, engineering, technology, mathematics, resource developers and managers, and health and medicine is abysmally low and is of significant concern (Aikenhead, 2006; Aikenhead & Michell, 2011; Mullens, 2001). In a time of land-claim settlements and moves to self-government all over Canada, Aboriginal people with scientific and technological education are needed to manage resources, build and maintain infrastructure, and deliver health care and other scientific services to their own people. This will specifically help Indigenous communities to initiate economic development projects and take greater control of land use, resources, education, and enhance Indigenous sovereignty (Aikenhead & Michell, 2011). Reasserting authority in areas of economic development and health care requires community expertise in science and technology. But for many Aboriginal students seeking to return to their home communities and work in health and science related careers, a serious disconnect is often experienced between the values and worldview of the Western Science learned at university, and the values and worldview of their home communities. Many graduates must unlearn, re-shape or in some way reconcile their new science to their Aboriginal world. As well, past experience has shown that filling positions in science and technology in Aboriginal communities with Aboriginal people is highly desirable because non-Aboriginal people typically remain in their positions for less than two years. In contrast, Aboriginal professionals remain in their positions much longer and bring stability and pride to their communities (CCL, 2007a, 2007b). The educational success of Aboriginal students increases Aboriginal people’s incomes and is seen as a major contributor to economic progress for a country (Sharpe & Arsenault, 2009). Choosing careers in science, technology, and health will benefit Aboriginal students directly through employment, but equally important, they can make a tremendous contribution to Canada from the unique understandings based on the values implicit in Indigenous Science and ways of knowing nature (CCL, 2007a, 2007b). Some people might ask, “What does science have to do with ‘sovereignty’ and ‘social justice’?” For a start, a worldwide renaissance now supports the sovereignty and cultural survival of Indigenous peoples (McKinley, 2007; Niezen, 2003). This movement toward sovereignty is about acknowledging, healing and rebuilding Indigenous nations oppressed by colonization. In 2007, the UN Convention of the Rights of Indigenous people was signed by 182 member nations, Canada signed in 2009. Prior to the imposition of schooling, Indigenous people had their own systems of passing on knowledge, values, language and culture onto the next generation. The school system has assumed the responsibility to educate the next generation. Those attending school have the right to have their knowledge, languages and cultures reflected in what they learn and how they learn. Indigenous peoples in Canada have always maintained that they want their children to have knowledge of both worlds, their own Indigenous world as well as the Euro-western world. According to some scholars, integrating IS into the science curriculum ensures access by all students to science education, and as such is a social justice issue (Aikenhead & Michell, 2012: Michie, 2000, 2002; Michie & Linkson, 2000). The issue of equity and social justice is complex because, as we have seen, many factors influence the phenomenon of under-representation: e.g., generations of colonial oppression, the residential schools, the absence of Indigenous Science in curriculum, the presence of racism and adverse living conditions. Nevertheless, as Métis science educator Madeleine MacIvor (1995) explains: “We [can] transform the science curriculum from one which is essentially assimilationist to one which honours, respects, and nurtures our traditional beliefs and lifeways, and which presents science and technology in a more authentic way” (p. 90). As Aikenhead and Michell (2011) point out, science educators have no direct influence over these factors, but they do have influence over how Indigenous students experience marginalization in science education. Why should IS be integrated into the science curriculum? The answer goes beyond social justice and economic issues. It is a survival issue for the planet. The survival of Indigenous cultures provides a wealth of information for all peoples dealing with the accumulated effects of non-sustainable human progress that have violated our planet’s life-giving biological support systems. In short, wisdom is present in Indigenous scientific knowledge where it is for the most part absent in Western scientific knowledge. The co-existence of IS alongside WS in the science curriculum serves as a new catalyst for learning where all students will gain substantially in their understanding of scientific knowledge, technology, society and the environment. The knowledge and wisdom of ancient and contemporary Indigenous peoples, especially their knowledge of specific home-places, represents a significant but historically neglected environmental knowledge and wisdom. As problems associated with resource depletion, burgeoning human populations, and ecological disasters worsen, increasing numbers of scientists, academics and environmental managers are turning to traditional knowledge for reliable, time-proven information regarding ecological processes and sustainability practices. Traditional knowledge and wisdom can provide important information and innovative strategies for implementing successful conservation and resource management programs (Corsiglia & Snively, 1997; Snively & Corsiglia, 2001). Thus, traditional knowledge can provide time-tested, in-depth information about a local area that may improve the effectiveness of sustainability and resource management strategies (Berkes, 1993; Knudtson & Suzuki, 1992; Menzies, 2006; Weatherford, 1991; Williams & Baines, 1993). Unlike Western Science, which can reduce nature to its value-free mechanical properties, traditional knowledge usually begins with respect for the spiritual essence that infuses creation—all life forms must be respected as essentially conscious, intrinsically valuable and interdependent. In practical terms, traditional wisdom extends the caring relationship associated with family life to communities and even to the environment. We are all relations: it is wrong to exploit or waste other life forms, or to take more than one’s share (Corsiglia & Snively, 1997). Clearly, the planet’s environmental crises cannot be solved solely with conventional WS and technology, but must call on knowledge systems that naturally embrace stewardship practices at their very core. Multiple ways of understanding the environment encourages hybridization and creativity, and enables all of us to view environmental problems from a variety of perspectives and to take sustainable action (Corsiglia & Snively, 1997; Davis, 2009; Sillitoe, 2007). It becomes increasingly important for educators to introduce students to the perspectives of both IS and WS in the science classroom because IS is used by scientists to solve important biological and ecological problems, and because problems of sustainability are pervasive and of very high interest to students and others. In addition to making science education more sensitive and appropriate to the needs of Aboriginal children, it is imperative that Indigenous people’s considerable contributions to science be elucidated for non-Aboriginal students. The introduction of Indigenous examples adds interest and excitement to the science classroom. All students need to identify and debate the strengths and limitations of different approaches in order to explore how others experience the world, and to broaden their understanding of the nature of science. A critical approach to teaching science can be used to help confront and eliminate racism, ignorance, stereotyping, prejudice, and feelings of alienation. All students need to be encouraged to examine their own taken-for-granted assumptions and to distinguish between those that reflect perfectly natural and appropriate cultural preferences and those that are rooted in misinformation or an unwillingness to allow for the existence of alternative perspectives (Snively, 1995). In classrooms with a wide ethno-cultural mix, it should be fairly easy for sensitive teachers to gather data and use resource persons of different cultural groups to explore different attitudes and beliefs about the environment. Discussion of differences in the ways in which societies view plants and animals, how they develop resources, and the reasons why they do so, establishes a base for discussion of environment, appropriate technology, and sustainable societies. As well, science education must emphasize the relationships between science and technology and the culture, values, and decision-making processes of the society within which we operate. As “outsiders” trying to make sense of a society continually being shaped and reshaped by science and technology, students need more from science instruction than an ever-increasing quantity of facts and concepts. Science education can help all students understand what science is—what its powers are, what its limitations are, and more importantly, what it can become. One of the best reasons for IS to co-exist alongside WS in the science curriculum is that it has been shown to enable Aboriginal students to participate and succeed in the science classroom. Research has evaluated the impact of implementing an enhanced science curriculum in a culturally responsive way (Aikenhead, 2006; Aikenhead & Michell, 2011). For example, in Alaska, the Native Knowledge Network produced a set of science curriculum materials for Yup’ik students whose standardized test scores uniformly improved over four years to match the US national average (Barnhardt, et. al., 2000). The focus should be on helping children of all cultures to understand western science concepts as well as Indigenous Science concepts and values, to explore differences and similarities between their own beliefs and western science concepts, to explore combining the two approaches to knowledge, and to be successful in school (Snively, 1995). A recent Delphi study conducted by the Canadian Education Association (2016), over a five-month period in early 2014 among a panel of over 100 Canadian science education specialists, university professors in the sciences and education, industry scientists, engineers and award-winning K-12 science teachers, and the science media, addressed questions related to identifying the priority areas of science education for Canadian youth. what might distinguish Canada as having a unique role internationally? Once the panel’s opinions were analyzed, a questionnaire was developed which asked the panel to rank in order of importance the dominant themes across the four questions, and to provide a justification for their respective positions. Between questionnaires, each member was provided with summaries of the group responses prior to the next round of deliberations. The process stopped when it appeared as though the positions of the panel had solidified, but not always with consensus achieved. If there was a common thread making its way through the deliberations of the national panel, it was that sustainability of the planet’s systems and humankind’s relationship with and influence upon those systems rises to the top of the list of priorities for science education in this country. No less important, the panel encouraged decreased emphasis on science education for student assessments and economic competitiveness; and encouraged a priority on making strong connections among the pure sciences, sustainability issues, socio-scientific issues, and the relevance of the curriculum for students. If we were to list the qualities that should characterize science education in Canada into the future, and do so on a priority basis, the national consensus from this panel would be summarized in Figure 2.1. Figure 2.1 ▲ Delphi Panel consensus on Canadian science priorities. Reprinted from J. J. Murray, (2015). 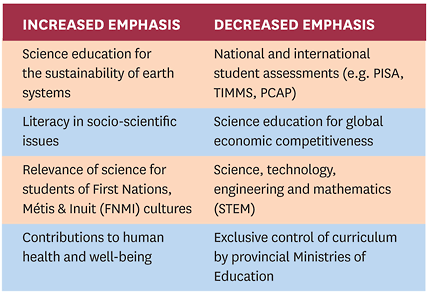 Re-visioning science education in Canada: A new polar identity and purpose. Education Canada, 55(4). CC BY NC-ND. Sustainability sciences provides for a balanced approach to how society alters the physical environment and how the state of the environment shapes society. “There is perhaps no clearer and more provocative vision for a truly Canadian science education, than one that could develop the knowledge, skills and attitudes necessary to attaining a more habitable planet for all” (p. 6). We are in an historic moment characterized by remarkable educational policy debate and change. Eurocentric scientists are increasingly recognizing Indigenous Science as an important and legitimate source of understanding the physical world. When teachers learn how the purposes of scientific activity have varied in different cultures and historical times, and how different cultures have developed science to meet their needs; they then can work towards developing innovative and sensitive resource materials and teaching strategies that encourage students to broaden their understanding of the nature of science and of the relationship between science and culture. Without the multicultural dimension, what we call “science education” is insufficient for our contemporary and future needs. Ministries of Education, the school system, and teacher education programs have the responsibility to deal respectfully with the knowledge and wisdom of Indigenous peoples. This may be difficult, but these responsibilities cannot be ignored. What is the current state of science education for Indigenous peoples? How did we arrive at the current state? What is at stake for Aboriginal learners? Should Indigenous Science be included in the science curriculum? What is the mandate for transformation of the science curriculum? What counts as transformation? How do we know we have it? What should be a new vision of science education for Canadian youth? Aikenhead, G. S. (2006). Science education for everyday life: Evidence-based practice. Ways of Knowing in Science and Mathematics Series. New York, NY: Teachers College Press. British Columbia Ministry of Education (BC MoE). (2011a). Provincial optional examinations—2010/11; Provincial public and independent schools combined. Victoria, BC, Canada: British Columbia Ministry of Education. British Columbia Ministry of Education (BC MoE). (2011b). Provincial required examinations—2010/11; Provincial public and independent schools combined. Victoria, BC, Canada: British Columbia Ministry of Education. Canadian Council on Learning (CCL). (2007b). Lessons in learning: The cultural divide in science education for Aboriginal learners. Ottawa, ON: Canadian Council on Learning. Cruikshank, J. (1991). Reading voices = Dän dhá ts’edenintth’é: Oral and written interpretations of the Yukon’s past. Vancouver, BC: Douglas & McIntyre. Hull, J. (2008). Aboriginal youth in the Canadian labour market. Horizons: Policy Research Initiative, 10(1), 40-44. Knudtson, P., & Suzuki, D. (1992). Wisdom of the elders: Honoring sacred Native visions of nature. Toronto, ON: Stoddart Publishing. McAskill, B., Holmes, G., Francis-Pelton, L., & Watt, W. (2004). WNCP Mathematics research project: Final Report. Victoria, BC, Canada: Hold Fast Consultants. McKinley, E. (2007). Postcolonialism, Indigenous students, and science education. In S. K. Abell & N.G. Lederman (Eds. ), Handbook of research on science education (pp. 199-226). Mahwah, NJ: Lawrence Erlbaum. Menzies, C. R. (Ed.) (2006). Traditional ecological knowledge and natural resource management. Lincoln, NE: University of Nebraska Press. Michie, M. (2000). Revitalising Indigenous science education: A synthesis of the Northern Territory experience. Proceedings of the Northern Territory Institute for Educational Research Symposium, May 2000. Michie, M., & Linkson, M. (2000). Providing teacher support materials for curriculum developments incorporating intercultural understandings in teaching science. Science Teachers Association of the Northern Territory Journal, 19/20, 59-68. Next: Chapter 3: "Coming to Know"
Chapter 2 - Why Transforming the Science Curriculum is Necessary for Aboriginal Students by Gloria Snively and Wanosts'a7 Lorna Williams is licensed under a Creative Commons Attribution-NonCommercial-ShareAlike 4.0 International License, except where otherwise noted.